This is a stellar category. 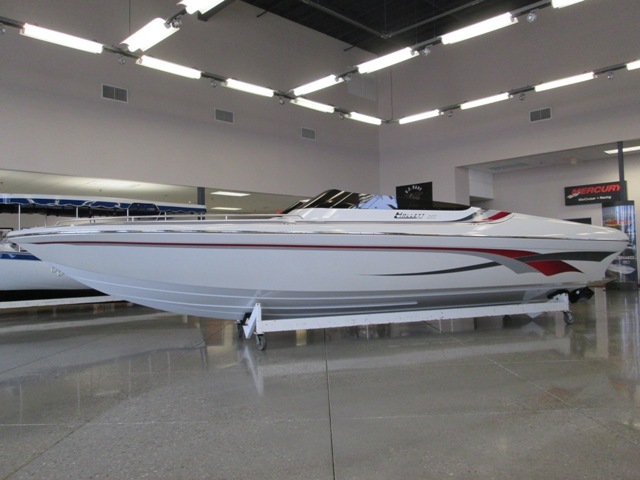 Single engine sport boats in the 25’ to 27’ range. I love a single engine sport boat as they have enough size for pretty serious open water, can hold a bunch of people effortlessly and yet they go really fast with a stock engine. This makes them some of the most cost effective boats around. Because this is a popular category, the list could be seriously long. We tried to cover many bases and include boats that are mainstream and some that are more custom. And, we have some great choices from the west coast and the east coast, with a couple manufacturers in between. If you’re torn between a family boat and a pure go fast, some of these offer the perfect compromise. Most of these boats can be bought for between $90k and $120k with stock power. In no particular order. The 25 Rage will be the smallest boat here technically, just shy of a full 25’ but it doesn’t compromise much. 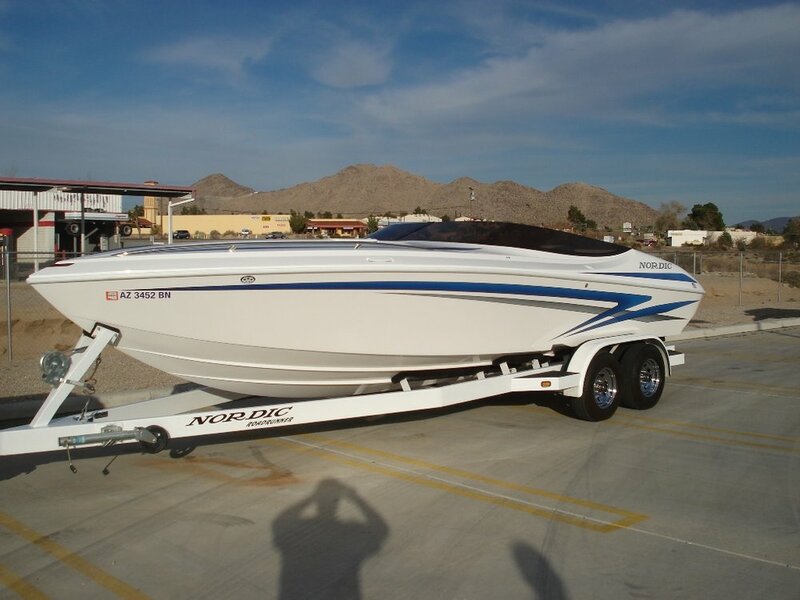 If anything, it will be among the fastest on the list, a stock 8.2L (430 HP) MerCruiser will push this around 73 MPH. The hull is light, full composite construction, excellent fit and finish. Nordic does beautiful rigging and the gelcoat work is very nice; what you would expect from a top custom California builder. Although the boat is available in different configurations, we like the closed bow version, true performance boats are closed bow. The design has stood the test of time. Nordic's are built strong and light, making it one of the fastest ones here. With a pad bottom and notched transom, the Nordic can be powered up and push past 80 MPH easily. Super stable at speed, with a 22 degree deadrise, the 25 Rage can handle some decent chop. The interior layout is standard issue for a real performance boat, the cabin has a nice simple lounge arrangement and is minimalist in a good way. 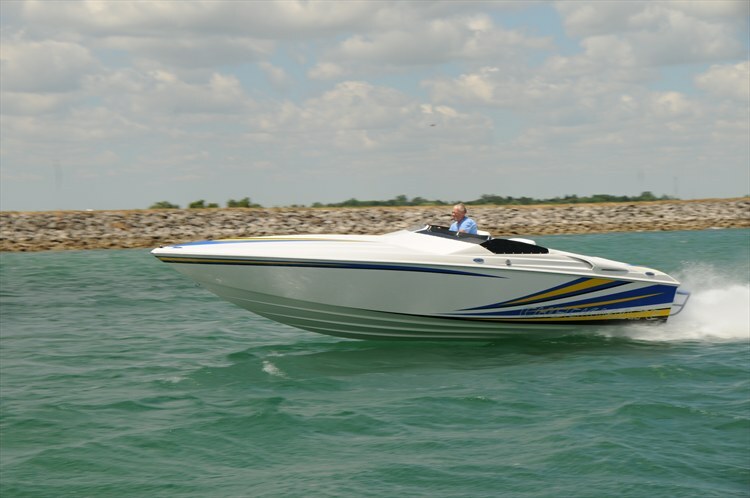 This is an excellent mid size performance boat from a leading manufacturer. With the Nordic, you can’t go wrong, incredible value and it looks amazing. The Lavey Craft 26 NuEra is everything that is great about Lavey Craft in one of the most well rounded boats on this list. One advantage is that it is actually a 27’ and has a deep 24 degree deadrise hull, making for a legitimate wave crusher that can handle big power. With the sharp deep V, ventilated steps and deep full length running strakes, this hull can run hard anywhere in any water. Although Lavey Craft is a west coast builder, the 26 would be great on the east coast as well. With a 24 degree V and built for the rough stuff, the Lavey Craft is probably one of the best all around midsize sport boats. Lavey Craft builds custom race boats and has been building everything from small outboard Mod-VPs and drag boats to factory racing with the 26, 2750 and 28 Evo. The 26 NuEra can be customized with many options. Lavey Craft uses a vacuum infused, hand laid balsa core construction, with vinylester resin. Colors and graphics are custom in the gel. Cockpits are fiberglass lined. All interior work is exceptionally done, custom seats and top of the line upholstery, custom to order. With a 600 HP engine, you are going to be in the low 80s. Old school, in a good way. Hustler has always represented a solid entry level offshore option in sizes from 26 to 38. This design is timeless. A narrow 8’ beam and deep 24 degree hull follows the “classic” formula for a competent mini-offshore hull. Exactly 26 in length with a generous 40” freeboard, makes the boat seem bigger than others in this class. Probably the best hull on this list if you’re going to be running consistently in big water. Like most small builders, you can choose from many engines but I think the best bet is the 8.2 430 HP MerCruiser, it makes it a very reliable performance boat. Narrower and deeper than the rest, with a traditional build, the Hustler is more suited to big water but doesn't need big power to go fast. Construction is traditional but solid. Hustler uses wood stringers fully encapsulated where any through bolting is fully inset with glass to seal it. Some are turned off by wood stringers but when done right, it is a proven method. The rest is vacuum bagged composite, no balsa, so the hull is strong and not too heavy. Pre 2000, the 266 was balsa. Cockpit has non skid floor and features Mcleod bolsters. If you’re running in big water and you really like a true deep traditional offshore boat, this is probably the best one on this list. As far as the mid size single engine categories goes, you could use the Howard as the one to measure all others against. In this size range there will be a compromise for something but the 25 Bullet doesn’t compromise much. State of the art build, rigged to perfection, custom to order with maybe the nicest finish work around. Howard uses fiber reinforced foam stringers encapsulated in glass, making it incredibly stiff and light. The hull has probably the best high speed potential on this list. You can load this with serious power and it will deliver a competent ride into the triple digits. Some of the boats here will get a little squirrelly getting around 90 MPH plus. The hull design is from the Howard 28 Bullet, which is a ventilated step design. Even though the 25 Bullet is light at 3,800 pounds, the balance makes it super stable. Aptly named, the 25 Bullet is the gold standard for this class. Super fast with any power, stable and top of the line build quality. If the compromise is that it’s not a true offshore capable boat, then that is the only one. This hull has 22.5 degree of deadrise which is not quite like true offshore hulls but when the hull is as well built and designed as the Bullet, it can run just fine in big water for its size. Some boats with deeper V hulls get hard to handle pushing the limit and need big power to go fast. With the Howard, expect to be in the mid 70s with a stock 8.2 430 HP. You won’t find a better built more stunning looking boat in this size range, in my opinion. If there is a bang for the buck boat here, this is it. Designed from scratch in 2012, with a really low profile deck on top of a deep 24 degree hull with generous freeboard. The Convincor 260 feels like a bigger boat, the 8’6 beam and 4,300 pound weight contribute to that. With checkmate you get really nice in the gel colors and graphics, solid standard equipment list like manual drop-out bolsters, digital instrumentation, and a 4 person rear bench. Bang for the buck, the Convincor 260 does everything pretty well at the right price. All Checkmates are fully balsa cored. With the standard 380 HP 8.2, you will be in the mid 60s and be under $100k for a well equipped good looking mid size sport boat. When it comes to design, the Hallett standouts out in a few ways. The 255 has the Hallett look, long, low and lean with a black inset windshield. With the 255-S, details like the moulded in fairing inset for the windshield and the long dashboard give it more style than many of the boats on here, which is saying a great deal because most of the boats on here are head turners at any dock anywhere. What I like about the Hallett 255 beyond the looks is the fit and finish, performance and value with standard features and stock power in this segment. For lakes and rivers this is near the top. Just a beautifully designed boat. Great value and well equipped from the start. Nordic has recently acquired Hallett and it will be interesting to see what changes happen in the construction of the hulls and if they will continue with all the models. Hallett has a bit of a log jam in this size range, with three versions of the 255-S, a 260 AC open bow, and the 270-S which also has 3 configurations: open bow, closed and mid cabin. The 260 AC is very neat, with a mod-vp style hull, center pod, deep outside sponsons, but it only comes in open bow; I hate open bow boats. On top of that, the 255 competes directly with the Nordic 25 Rage, as they are very similar in size and offerings. The Nordic is faster, partly because of the newer construction methods, Hallett is a little old school in construction. For rivers and lakes, the choice between the 255 and the 25 Rage comes down to personal preference. Every boat on this list comes with quality standard equipment and great rigging. If it was me, I’d have it with stock power, an 8.2 430 HP, you get turn key warrantied performance right out of the box. Hallett provides a generous standard equipment list, so you can get on the water at a really good price. With it’s straight 20 degree traditional V-hull, you can be just shy of 70 MPH. Hallett builds a fully balsa cored hull, making the end result a 3,800 pound boat, exactly 25’6 long and the beam is 8’6. A very nice cabin makes this a really good family boat. Nice additions include a moulded foot rest for the passenger and the floor is a traditional teak, with a snap out carpet. Tough to beat sitting facing forward in a well padded seat. Standard rear bench beats everything. Standard dash equipment, Livorsi gauges and offshore style levers and dropout bolsters. Checkmate Convincor 260.